THE Ramu Nickel/Cobalt project in Madang recorded high production rate in the final quarter of last year, the company says. It said this demonstrated that the system had gone into a stage of high-load and stable production. High production was achieved despite financial, technical and managerial challenges including the April 12 incident last year at Basamuk refinery which affected the achievement of planned design capacity annual target and production capacity for 2016. Ramu NiCo Management (MCC) Ltd president Gao Yongxue announced this on Tuesday during the company’s 2017 annual work conference via video conferencing. 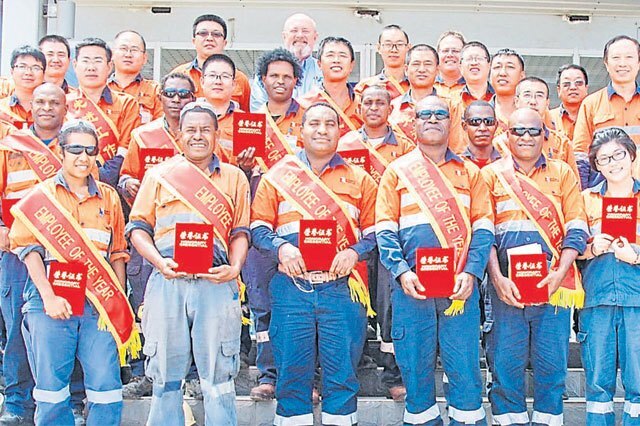 It was between Beijing and the company employees and management at Kurumbukari (KBK) mine, Basamuk refinery and Madang Base. “The metal nickel output in October, November and December (2016) reached respectively 2,645ton, 2,764ton and 2,711ton – a record high production rate of 98.7 per cent, 100 per cent and 101.2 per cent design capacity,” Yongxue said. Yongxue said tireless efforts and dedication from company executives, employees from all sites with support from stakeholders following the issuing of the permanent mine operation permit by the Mineral Resources Authority saw huge improvement in production capacity towards the end of last year. “Slurry deliveries from KBK mine and high pressure acid leaching ore throughout at Basamuk refinery have both exceeded 10,000 ton (dry base) per day, much higher than expected from the design,” Yongxue said. He said technical parameters at the KBK mine and Basamuk refinery had improved steadily last year which had delivered a high output. Nickel and the recovery rate at KBK mine improved throughout the year and reached the annual target. Yongxue said a permanent mine operational permit was granted by the Government.